Dandelions are detested and cursed by gardeners and homeowners who pride themselves in their lawns. No matter how many you pull out - more are on the way or already there hiding in wait until they appear like magic. Although generally considered pesky weeds, here are some interesting facts including beneficial qualities of dandelions. Dandelions are self-pollinating perennial herbs and therefore do not need insects to produce seed, although bees do use them in their quest for the production of honey. They produce downy white seedheads in the shape of a perfect ball. Individual dandelion seeds weigh next to nothing and are widely distributed by the wind. Dandelions are a valuable and well loved food source for animals of all kinds including turtles, tortoises, wild and domesticated rabbits. Many people don't realize that you can use dandelion leaves in cooking. Tender dandelion greens are a tasty addition to green salads and make a great sidedish when sauteed with onion and garlic. Dried as well as fresh leaves are also used for teas and tonics. 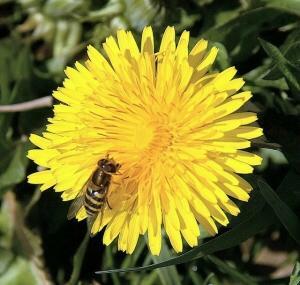 The flowers are edible as well and are used to make dandelion wine which is perfectly delicious. The taproot is another edible part of the plant. This can be prepared like cooked vegetables or used in vegetable stew or soup. Dandelion roots are widely used as a medicine throughout the world. You can puchase herbal remedies containing dandelion root for a variety of ailments. Dandelion plants are highly adaptable and will grow almost anywhere including moist low-lying meadows where their brilliant color sparkles and stands out. Nature has a purpose for every living thing, including the beauty, hardiness and useful qualities of the lowly dandelion. Let a few dandelions live, thrive and prosper in your backyard garden.